Infinity Beach Club offers its guests comfort, facilities such as its grandiose swimming pool and jacuzzi with some real service. 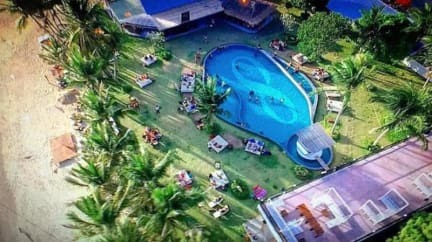 As with other hostels on the island, guests can use the service desk to hire bikes or arrange taxis etc but also a more luxurious service from the staff whilst enjoying time at Infinity. They are polite, attentive and professional always. Most hostels are on the main road but Infinity is right on the beach, you just cannot compare. Infinity gives you a bit more of that tropical chic style. Infinity Beach Club’s cozy dorm rooms puts them in the ‘hostel’ segment but as we all know, there are different kinds of hostels and Infinity is bringing a more upscale hostel vibe. We have one room consisting of six beds, three rooms of eight beds and one which has eighteen. Infinity Beach Club offers a huge range of food from the 2 restaurants on site including snacks, sushi plus a la carte and seafood for some really special dinners with friends or loved ones. 1. Check-in Time: from 13:00. 4. Cancellation Policy: Up to 10 days advance notice before the arrival date is required. (1) Infinity Beach Club is not suitable for families and children. (2) The minimum age to check in is 16 years old. 6. Reception Hours: from 07:00 to 22:00, except during the the full moon festival until midnight. 7. Tours, taxi, motorbike and car rental are available at the reception. Stayed here recently with my boyfriend in an 18 bed dorm and really enjoyed it. Rooms are quite cramped but the rest is lovely, food is great and pool area is amazing they have a dj playing in days and evening. Staff are amazing, the owner even drove us to our ferry so we didn’t miss it. Would definitely recommend and come back! Great place, Amazing view. Food is excellent. You eat sushi like no where else ! Manager also helped me to find good places to chill. We got a really nice stay and the beach in front of the resort is such amazing! We also enjoyed their beach pool, it was big, clean and really relaxing. Good cocktails, the room was fine. We would definitely recommend it! On the beach so amazing Location, nice pool and sunbeds. Only negative is that when I booked, I chose mixed dorm but when I arrived I was told that because I'm female I have been put into a female only dorm because they double sold the room I booked. The reason I chose mixed is because I was traveling with my boyfriend and we were sharing a bag and prefer to chill in the same bed. So very annoyed by this. Cool place with amazing pool and nice beach. Staff were friendly. HOWEVER, the hostel was completely empty (maybe low season?) so wasn’t very sociable! Food is expensive. Dorms were poor - hard mattress, thin blanket and curtains covered half the windows! Overall beautiful place. Beautiful grounds and beach. Great food as well. However the place is so damn far from town it costs a fortune going in and out everyday, and the layout of the place is weird. Showers have no room so everything gets soaked in there and bathrooms are across the place. Nothing is close by. Also beds are very hard but rooms have great AC. mixed feelings about the place but probably wouldn’t stay there again.